Participants at the 'Conference on current problems in crystal physics' convened by the Commission on Solid-State Physics of the International Union of Pure and Applied Physics, held at the Massachusetts Institute of Technology. The photograph was taken on 2 July 1957 and sent to the IUCr in 1994 by Owen S. Mills. First row: R. Smoluchowski, J. M. Robertson, R. C. L. Slater, D. W. J. Cruickshank, H. A. Levy, T. Nagayima, R. J. Elliott, F. Herman, B. Lax, E. H. Jacobsen, G. P. Thomson, J. C. Slater, W. H. Taylor, B. N. Brockhouse, G. E. Bacon, H. D. Megaw, J. Laval, R. D. Lowde, E. Wölfel, S. Miyake, M. Renninger. Second row: W. Cochran, P. Marcus, E. Burstein, L. Guttman, Y. Komura, J. Kakinoki, J. A. Bland, S. Ogawa, H. Yoshizumi, I. Karle, M. Blackman, D. P. Shoemaker, C. G. Shull, S. C. Abrahams, C. H. McGillavry, S. Hoshino, T. Watanabe, S. Ullman, J. M. Bijvoet, B. C. Frazer, W. A. Wooster, T. C. Furnas Jr, J. J. Demarco. Third row: T. A. Kaplan, ?, M. Hass, J. W. Davisson, T. Fujiwara, L. Muldawer, S. A. Friedberg, I. Pelah, G. Honjo, A. B. Wing, J. deLaunay, H. Amar, D. K. C. MacDonald, S. S. Sidhu, P. A. Agron, I. Nitta, G. A. Jeffrey, P. B. Braun, R. Ueda, A. W. Saenz, D. R. Chipman, K. J. Tauer. Fourth row: C. B. Walker, G. Shirane, H. E. Petch, G. J. Goldsmith, H. Cole, J. Gibson, A. Seeger, G. M. J. Schmidt, D. S. Lieberman, R. Mason, J. Karle, H. P. Rooksby, A. J. Guinier, E. I. Salkowitz, H. Curien, A. Merpin, Mme Herpin, E. F. Bertaut, S. W. Petersen, E. O. Wollan, J. M. Cowley, M. Lax, W. C. Koehler. 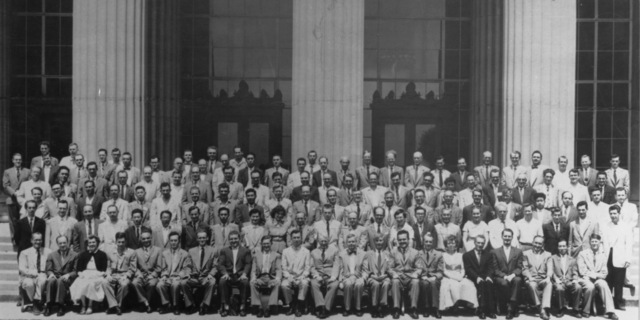 Topmost rows (left to right): A. Taylor, Y. LeCorre, J. J. Markham, B. W. Roberts, C. B. Walker, G. H. Vineyard, L. C. Allen, J. M. Hastings, S. Foner, D. R. Hartree, A. J. Freeman, J. E. Goldman, F. E. Williams, G. W. Pratt, L. M. Corliss, K. Tanaka, H. Hauptman, A. Paskin, ?, J. J. Antal, I. Waller, G. Hägg, A. J. C. Wilson, P. P. Ewald, E. W. J. Mitchell, W. Gruner, D. Harker, C. F. E. VonSydow, J. L. Katz, J. Donohue, M. K. Wilkinson, A. C. Hurley.